Jamiyah Welfare Fund : Serving Social & Welfare Needs of the Community. It is among societies providing care and assistance to those in need, such as the disabled, less fortunate, widows, orphans and families of drug detainees. It has three services which are the free medical clinic, free legal clinic as well as the bi-monthly food ration. Jamiyah envisions to achieve its mission by striving continuously with its stated objectives. By planning and implementing relevant programmes & services with the cooperation of its members and the general public regardless of race or religion. 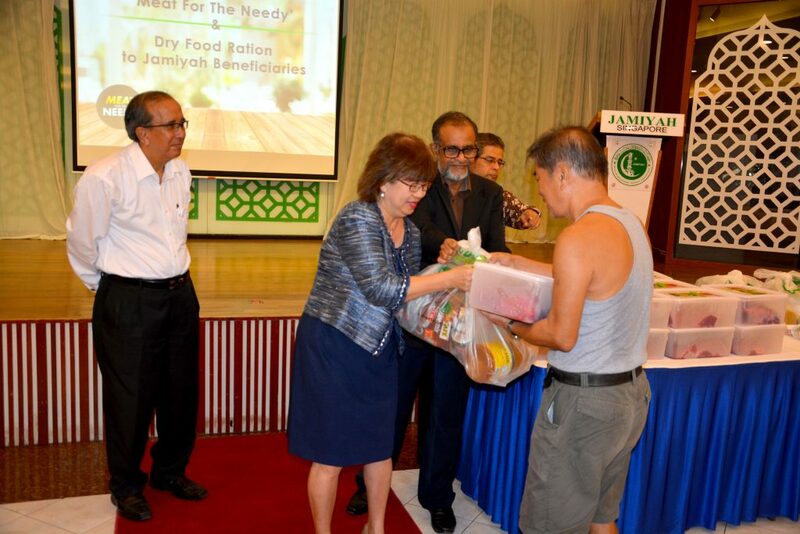 In conjunction with the upcoming festive celebration of Hari Raya Aidilfitri, Jamiyah Singapore has organised ‘Meat for the Needy’ where some 1,000 beneficiaries of Jamiyah from several constituencies such as Marsiling and Whampoa receive up to 3kg of packed meat each throughout the three-day distribution drive. Darul Ma'Wa - An abode of care and shelter to orphans, children from disadvantaged families, regardless of race or religion. Darul Takrim - Home for the Aged and destitute that provides shelter and care irrespective of race and religion since 1997. Darul Syifaa - provides residential medical nursing care and serves the psychological, social and spiritual needs of the Aged sick. Darul Islah - Jamiyah Halfway House serves as a centre of rehabilitation for substance abusers. It is among societies providing care and assistance to those in need, such as the disabled, less fortunate, widows, orphans and families. The assistance mentioned above is open to all and sundry in Singapore regardless of race or religion. Jamiyah Food Bank, JamPacked, collects, sorts, stores and distributes donated food items to poor and needy families.